Know different ranks to make money from SFI Affiliate Program. In another article, I have written about the basic four steps to start SFI business and you should learn that first before getting into this article further. The SFI program comprises of different stages [Ranks] which determine the commission rate for their affiliates. When you join as an SFI Affiliate, you should work to maintain your rank in every month to become eligible for the commissions and payouts. Let’s learn further deeply the different ranks and the target you need to achieve to earn such a great monthly income. SFI business concept is really so simple to understand and work. SCORING VERSA POINTS($0.0004) and generating sales at TripleClicks.com are a great way to earn money in SFI, which determines our RANK and EARNING POTENTIAL. Steps to make money from SFI? Friends, so you are ready to start your financial free future. Before starting, you may need to know what is VP. VP’s are the points that will be allotted for every action you are doing in SFI, Including logging in daily, completing to-do-list tasks, completing daily, weekly, monthly actions, products promoting and selling etc. Almost all your actions are converted into real money only in SFI. STEP 1: login to your sfimg home page. STEP 2: Once you landed on your Affiliate home page, you may see many red tabs. Click and review all tabs and complete all actions including reviewing pages, confirming registration, reading launchpad etc. Complete all tasks and score 500VP. 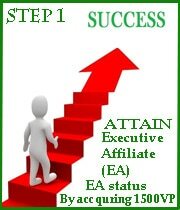 If a new affiliate score 500VP in a single day, he will get a bonus of 200VP which adds up to attain EA status. Then, study SFI completely through LAUNCH PAD along with you will get additional 450VP. Which sums up total 1150VP in your first month. Complete remaining GETTING STARTED actions and score 1500VP in your first month and boost your rank to Executive affiliate. » Once you attain EA status your income starts to flow in your hand in SFI. 1.) Each time an SFI affiliate that you are the co-sponsor of places an order at Triple Clicks.com, you earn 15% of the CV. Important Note: You must maintain EA (Executive Affiliate) status to retain any CSAs you have been assigned. If you lose your EA status, all the CSAs you have acquired till date will be forfeited. Acquiring co-sponsors is one of the easiest ways in earning in SFI. 1. A minimum of TWO (2) CSAs are allotted to you each month you attain the rank of EA (minimum 1500 VP). 5. Shares of all available Second Home* CSAs are awarded to SFI Team Leaders each month. ••• 4 shares if you are a Platinum Team Leader. Second Home CSAs are assigned on or about the 15th of each month. The next status in SFI is the team leader and the first position is the Bronze team leader. BTL means the first level in the team leader carrier within which you will earn commissions up to 6Levels of affiliates. To become a team leader you must have a team in your downlines, first build your team using suggested marketing methods in SFI. A VP of Min 3000 to Max 3999VP in a particular month escalates your status to BTL. A VP of Min 4000 to Max 4999VP in a particular month escalates your status to STL. A VP of Min 5000 to Max 5999VP in a particular month escalates your status to GTL. A VP of 6000VP or more in a particular month escalates your status to PTL.